In this module you will learn the meaning of tantra, how tantra works, and why it is a powerful form of practice if done with the right foundation of understanding and practice. Get a broad overview of the distinction between sutra and tantra, the four classes of tantra and the meaning of deity yoga. In addition, find out how to integrate the practices of tantra with lam-rim meditation for optimal results. 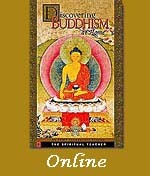 A 26-minute video for Module 13 from the Discovering Buddhism DVD. Four teaching sessions and two guided meditations taught by Jon Landaw. A PDF transcript for all these teaching and meditation sessions is also provided.